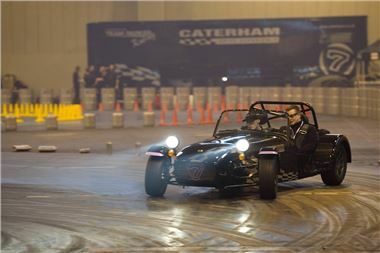 During the four-day show, several thousand show goers will sample a Seven at full-throttle beside one of Caterham's professional drivers in Hall 4 of Birmingham's NEC. James Drake, Caterham Cars' Marketing Manager, said: "Having nearly our full 'family' of race cars come together like this is very exciting for us. Only the GP2 car is missing but we've so much going on at the stand and at the live action arena that we just couldn't pack it all in. "I'm sure that any motorsport fan will be impressed by the growing line-up of Caterham vehicles but Caterham has always been about much more than 'cars on carpet' and our live action arena will bring all of that motorsport prowess to life for visitors." 12-15 January 2012 at NEC Birmingham, UK.